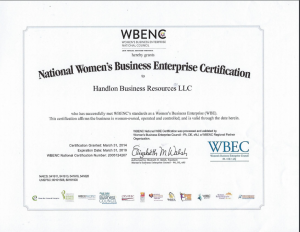 Handlon Business Resources (HBR) has been certified as a women owned business since 2008. Current certifications include: WBENC, Pennsylvania Small Diverse and US SBA Women Owned Small Business. 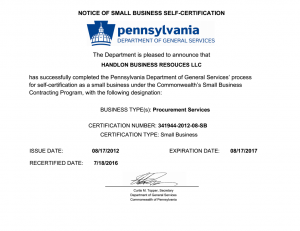 If you are seeking a sub-contractor to assist in meeting a small business requirement, consider Handlon Business Resources. Our capability statement is available to download. HBR also assists companies in locating additional certified small businesses (women, minority and veteran-owned) to provide more options to meeting the small business contract requirements. This service is predominately eastern PA with a Lehigh Valley concentration. The service ranges from identification to vetting, based on company requirements. And, small women, minority or veteran owned business seeking certification have HBR as “coach” to help complete certification requirements. Thinking of adding a Supplier Diversity aspect to your procurement process? HBR can assist in helping to evaluate your current spend and provide recommendations for implementing a Supplier Diversity component to your program.